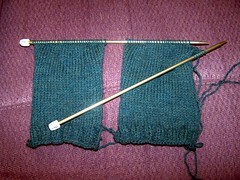 Posted on January 5, 2007	by Linda S.
I started a pair of wrist warmers … just plain jane. The basic pattern was posted here on Melissa’s Tiny Happy blog. I am elongating them a bit and using larger needles since I am making them for one of my sons. My major problem is the second one..grin Never could seem to get them both the same size. A while back I was surfing through the knitting blogs and found that socks were being done 2 at a time on the needles. Aha! I can do that! So this is my first try at doing 2 at a time. And it seems to be working. I am loving this! This entry was posted in Free Patterns, Handwork, Knit, Needlework. Bookmark the permalink.